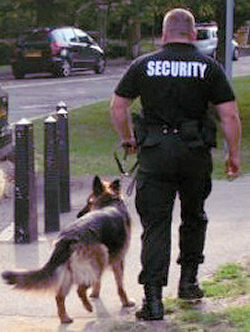 If you have a need for safeguarding full warehouses or isolated industrial estates from robbery or preventing evicted squatters from re-occupying a vacant property, or maintaining crowd control in tough circumstances then security dog units will provide a highly effective security solution in cases where a lone security officer would be outnumbered. In addition to ensuring efficient security, our highly experienced security dog handlers offer a very cost-effective security alternative as they have the ability to replace multiple security officers. The presence and visibility of uniformed security guards is greatly enhanced if those specialists are professional dog handlers, using the animal’s excellent ability for detection of trespassers or intruders through their exceptional eyesight, keen sense of smell and their sharp hearing. Often the security dog handler will be alerted to unexpected activities by a dog long before they can be seen or heard and picked up on surveillance systems. As well as being fully SIA-Licensed security officers, all our security dog handlers are trained and qualified according to NASDU standards (National Association of Security Dog Users). AGuard Security are fully committed to a training programme for all dog handlers as members of NASDU.